Ovalhouse &diam; 13th - 22nd October 2016. Nothing if not believable: Sophie Baggott reviews Theatre Témoin’s play about homelessness and alcoholism. The Marked at Ovalhouse. Photo: Idil Sukan. In The Marked, Jack (Bradley Thompson) is a kind but troubled man steered into homelessness by the ‘demons’ of his now-dead mother’s alcoholism. Childhood memories of drunken abuse haunt him as he tosses and turns through the nights he spends next to wheelie bins. His days pass with company available only from pigeons, hostile strangers and – suddenly – a likewise homeless couple. This pair come to play an odd, influential role in his life as Jack’s story progresses. The darkness of the subject matter is matched in the almost eerily dark set design. The heavy theme of alcoholism had escaped me when I initially looked into the production, and perhaps might have dissuaded me (the daughter of a chronic alcoholic) from seeking out a ticket. Jack’s angst, rooted in the clinking sound of stashed bottles and tidal mood swings, is nothing if not believable. Also achingly accurate is the fact that, unlike in many plays, the dialogue takes a somewhat minor role. The three-person cast aim to show, rather than tell. 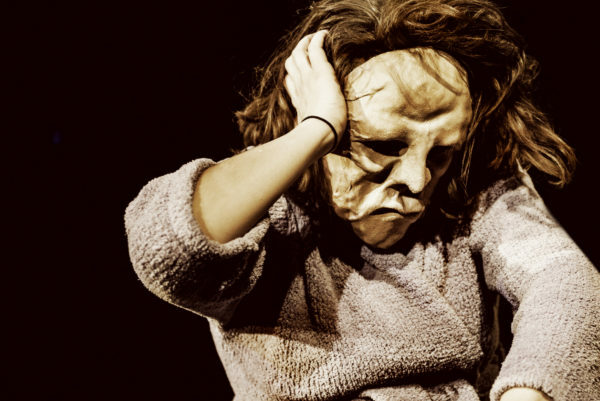 Through puppetry, grotesque masks and physical theatre the actors succeed in conveying the commonly mute terror of living under an alcoholic. To say anything out loud is, more often than not, taboo. The play was developed alongside various community consultants with experience of homelessness from Cardboard Citizens, St Mungo’s, YMCA and Mosaic Clubhouse. Inspired by real-life stories of homelessness, the plot is simple but powerful. At the beginning Jack strings out his time by feeding pigeons and running from aggressive presences, until he bumps into a woman. This newcomer (played by Dorie Kinnear) and her partner (Tom Stacy) knock Jack’s mundane days out of sync. The plot is, in fact, fairly uneventful throughout the hour-long show. What it does do is give a glimpse of the sheer loneliness of having no home – even if that home had been less of an anchor, more of a sinking ship. However, this simple storyline is not quite the play’s strength. It someways it’s actually quite knotty and hard to follow, perhaps echoing the genuine experience of people in Jack’s situation, but not making for compelling theatre. Instead The Marked should be valued for its bold and highly technical approach to a difficult topic. Under the direction of Ailin Conant, the acting trio impress through some incredibly nimble costume changes and unexpected re-appearances. While this is not a show that can offer a lighthearted evening out, its shadow-ridden story will likely lead to some interesting conversations about the causes of homelessness – and hopefully prompt a little extra empathy for those the audience members might usually pass by, out on the pavements. The Marked is on until 22nd October 2016 at Ovalhouse. Click here for more information.